To be sure, a well designed and professionally installed cabling system can eliminate the need for costly re-cabling in the future. Also, integrating multiple data cabling technologies can increase your networks production capabilities. In addition, adherence to established industry standards helps to ensure the continued functionality of your structured cabling system. 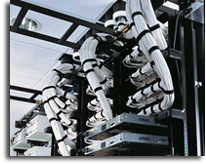 ITS Telecom understands the importance of a functional and reliable structured cabling environment. With proper planning, installation and maintenance, this most basic requirement of your data system will help to eliminate the frustration of poor network performance and/or downtime.